Yesterday, Facebook reported its Q3 earnings, beating expectations for user numbers and revenue. Despite its continual growth, Facebook has repeatedly warned that because it can only show so many ads, its revenue growth will eventually have to slow. As we can see in this chart from Statista, U.S. and Canada based users make the company the most money, but represent the smallest group of users. 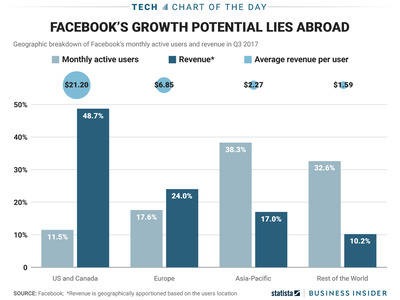 Active Facebookers in the U.S. and Canada generate $US21.20 per person in advertising revenue for the company, while those in the Asia-Pacific region generate only $US2.27 each. These numbers show an interesting opportunity and challenge for Facebook. Americans are some of the world’s biggest consumers and advertisers are happy to throw money at them, but those in more remote or third world areas are harder to reach and don’t have anywhere near the spending power of Western users. If it wants to keep growing, Facebook will either have to figure out a way to monetise this hard to reach group or find another alley to turn down in the U.S.